CCP’s annual fan events, hosted in Las Vegas and the developer’s home town of Reykjavik, are an important part of the company’s culture. Like town hall meetings, but with more alcohol. 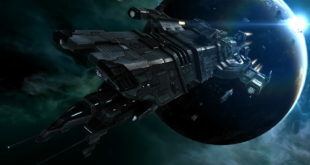 They are key touch points for CCP to connect with players of EVE Online, the single shard MMO that serves as a battleground (both politically and with lasers) for a growing number of spaceship fans. The perfect place to discuss the future of the game and, quite literally, the universe. At EVE Vegas 2017, taking place just shortly after the game’s biggest ever political scandal and heist, emphasis on community was clear. Here were enemies – people who had stolen many thousands of dollars worth of in-game assets, who had ruined careers and reputations within the EVE universe – mingling and chatting and drinking together in apparent harmony. The timing of this year’s Vegas event came at a difficult time, just a week after the Mandalay Bay shooting. The 1000 attendees at EVE Vegas, plus many more EVE fans at home, contributed over £16000 to the various charities offering relief to those affected. Something that came as no surprise to Pétursson. “It’s pretty amazing,” he says. “It’s something that we just know about our community. We’ve done so many collection efforts with the community for various events around the world. The first one we did was the tsunami in 2004 in South East Asia. That was the first community collection drive we did and it was amazingly well received. Having such a generous community is enviable in a climate where certain facets of game fandom have problems with toxicity. How has CCP built such a delightful, passionate fanbase? In short, through mutual trust and respect, as well as an open dialogue and active listening by CCP. “I can tell you how it all started,” says Pétursson. “Back in 2003 we had just released EVE Online. It wasn’t done, but it was done just enough to get it out there. We had a small staff up in Iceland and we were running out of money, so we had to release the game. So there was no huge methodical plan, even though we intuitively knew that getting players into it was a way to, in a way, complete the game. But it wasn’t a fully thought out go-to-market strategy. It just felt right. “Then people came into the game and they populated the world. They started to build their own adventures, just like we hoped for. But then they took it to eleven, or more like eleven hundred. So we thought ‘okay, this is probably a thing – co-creating a game with the community’. But we didn’t really have language for it back then. We were just doing this all out of raw intuition. “It was pretty cool for a while, but then we weren’t able to keep up. People’s demands for progress were higher than our ability to get it done. So it ended up in this kind of unproductive state for a while, around early 2004. People were impatient about getting some things fixed, they were arguing a lot on the forums, and I thought ‘ugh, I wish we could just have them over, and we could talk it through. We need something like, I don’t know, like a conference’. Fans were arguing a lot on the forums, and I though ‘Ugh, I wish we could just have them over, and we could talk it through. “I remember sitting in my office and deciding ‘okay, let’s just do that!’. So then we advertised and said ‘we’re having a FanFest in the autumn of 2004 and it’s going to be in Iceland and I hope you guys come. We’re going to talk about spaceships and what the plans are for the future.’ At the time this idea was complete madness. “We thought that maybe thirty people would come. We sold three hundred tickets. Three hundred people flew to Iceland, some getting passports for the first time. Then when everyone was together in person it was a super productive way of talking through things. People immediately saw that we were killing ourselves trying to make the game tick. It turns out that a mutual understand of your audience (and theirs of you) as actual people is key to developing strong community relationships. Not only building a relationship with them as developers, but also understanding that they will all have interpersonal relationships with one another. Especially in a game so intrinsically political as EVE Online. “We came up with the Council of Interstellar Management,” says Pétursson. “Where people are elected to be representatives of certain areas of the game. As the years have passed we have developed these mechanisms to have structured engagement on how to evolve the game going forward. So, in a way, the game is not done yet. We’re still co-creating it with the playerbase. 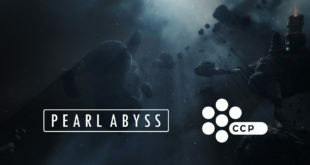 Perhaps it is developing a game alongside its fans that led CCP to seeking other studios to work with for two upcoming projects. Project Aurora and Project Nova were both announced at EVE Vegas this year, as well of the development partners who will be working on each. Project Aurora is intended to be an EVE Online experience shrunk down for mobile, while still retaining the full depth and strategy boasted by its bigger brother. It is being co-developed by mobile developer PlayRaven. Project Nova, on the other hand, is a resurrected project long assumed dead by the EVE community. A first person shooter set in the EVE universe. Little more is known about it, other than the fact that UK studio Sumo Digital is helping CCP bring it to life. “In my view, the industry is becoming more and more specialised,” says Pétursson. “The different platforms and genres require more and more specialisation, and having all of that talent in house is not a very sustainable thing. By co-developing, we are tapping into people who have specialised in certain genres and platforms; in the case of Sumo, for shooters and in the case of PlayRaven, for mobile. But CCP isn’t precious. If you’re relying on external developers to input into your design and codebase, you can’t afford to be. Otherwise you’re not fully taking advantage of the skills and expertise they have to offer. Different platforms and genres require specialisation, and having all of that talent in-house is not very sustainable. So how does one go about finding the perfect development partner for projects like these? “In the case of PlayRaven, I’ve known them for years. We met up last year at a conference I was attending with my head of product and head of marketing. We already had this idea on the roadmap, of a strategic EVE mobile game. And PlayRaven were already gearing up to do something similar. So it was a bit of a serendipitous meeting of the minds. Then of course we went through all the paces of seeing if it really panned out, and it did and now we’re here. “In the case of Sumo, we had a fairly broad process of talking to a lot of people who have that kind of shooter specialisation. Working with each and every one, seeing how they see it, explaining how we saw it. The greatest fit out of that process was with Sumo. That’s why we partnered with them on that front. The EVE Vegas event is very different to Fanfests hosted in CCP’s hometown of Reykjavik. The glitz and the scale of Las Vegas has a hugely different vibe to the capital of Iceland, where the studio is very much a big fish in a small pond. Fans we spoke to at EVE Vegas reminisce fondly on the “invasion” of EVE Online fans, taking over entire bars and eateries as the group maneuvers through Reykjavik during the event’s popular Pub Crawl. 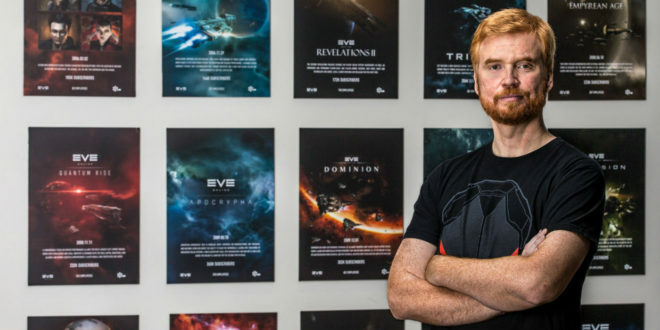 CCP’s existence in the region has helped the games development community in Iceland grow. Not only through the company’s willingness to help new studios get on their feet, but by inspiring and encouraging investment in development skills. “Iceland is a country of 300,000 people,” Pétursson says. “Just to put it into perspective, it’s like Brighton in size. Just like there’s a games community in Brighton, that’s Iceland. There are a lot of companies, maybe 20 games companies in Iceland and I think that plays some part in inspiring people to go and try out their skills in making computer games. Nobody really has broken through yet, but certainly there’s a fairly vibrant ecosystem compared to the size of the country. 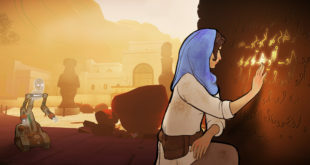 For those looking to create their first games, wherever you may be living, Pétursson has some sound words of advice, along with one question: What’s stopping you? “It’s easier than ever to make a game,” he says. “You have excellent tools and you have all of these Early Access phenomena, which is a great way for a small first-time team to get something out there. I would encourage people to do something simple and quick and release it. Go through one cycle. Don’t try to get it right the first go. Because you don’t really have to today. 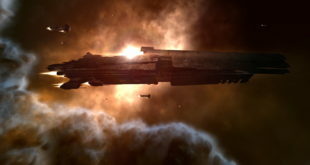 “When we were making EVE Online we had to make everything. We had to make the engine, the server architecture… Oh my god we had to make so much stuff. Now, you just get your engine, get your plan together, release it on early access and voila! And if it doesn’t work out, you can try again, because the tools are available, you don’t have to make everything.